Hello stampers. What a mouthful of a name for this beautiful paper. It is indeed Delightfully Detailed Laser Cut Paper. 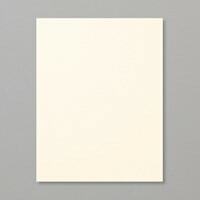 This paper is so beautiful that it doesn’t need much embellishment to make a pretty card. 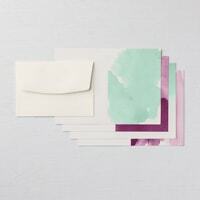 We made them at our team gathering last night so that I could show how easy it was to use, especially when you pair it with our Delightfully Detailed notecards and envelopes. The coordinating notecards come in mint macaron and blackberry bliss in either a watercolour wash background or in an ombre background. The panels in the Delightfully Detailed Laser Cut Paper fit perfectly on these notecards. All you need to do is add a sentiment and maybe one embellishment. I chose the pretty bird or flowers from Petal Palette. We could do a “Where’s Waldo” of free saleabration products here. Actually there are only two, but still it could be fun! The Delightfully Detailed Laser Cut Paper is free with a $60 purchase and so is the rich razzleberry velvet ribbon (in fact you get two spools free with a $60 order). This offer ends on Sunday March 31. 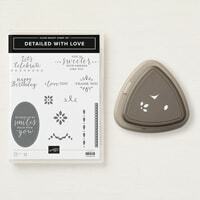 The Detailed Trio punch and the Detailed With Love stamp set are also a part of the Delightfully Detailed suite of products found on page 38 and 39 of the annual catalog. 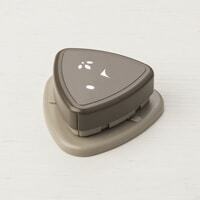 The punch and the stamp set are also available in a bundle allowing you to save 10%. The polka dot tulle ribbon that I use so often is also a part of this suite. 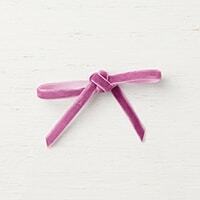 This ribbon is very light and therefore not bulky at all and ideal for mailing. 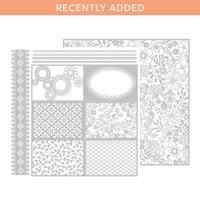 Thanks to Lynn Dunn for the inspiration to use Petal Palette with the Delightfully Detailed Laser Cut Paper and the Delightfully Detailed notecards and envelopes. I coloured the bird with Balmy Blue Blends and stamped the sentiment in Mint Macaron. Oh how I love this particular card. I love the ethereal quality of the laser cut paper so much. Add that to the watercolour wash background of the Delightfully Detailed notecards and envelopes and you have an easy winner. I coloured this bird with Balmy Blue Blends as well. 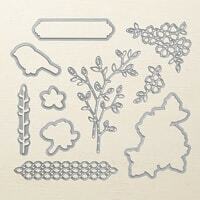 It’s so nice that there are framelits to coordinate with this stamp set, so no fussy cutting. 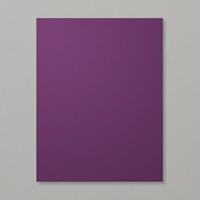 This last card uses the blackberry bliss ombre background. I coloured the flowers with granny apple green and blackberry bliss blends. The Blends are just so easy to work with, the colour goes on so smoothly. I used a sponge and a silicone mat to apply tombow adhesive to the back of all the Delightfully Detailed Laser Cut Paper pieces. This works so well; there is no oozing of extra adhesive anywhere. I hope you liked these cards, they truly are a delight to make! 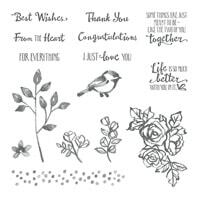 You could go for a tone on tone effect and use our regular notecards and envelopes as well, but I do prefer the beautiful Delightfully Detailed notecards and envelopes that I used in these samples. As always, just click on any of the supplies below and you will be taken to my online store. As long as you live in Canada you can shop with me. If your wish list is long, consider getting the starter kit. The amazing deal where you get $225 of any product you wish for only $135 ends on Sunday. Here is the link if you want to choose that option. Before you get started, have a wish list of items you want, your social insurance number (to prove that you are a real human!) and a credit card. I thank you for stopping by today and I hope you have a super day!